Macabeo lemon jasmine tea - Monsieur T.
Composed of premium green and white teas (Chinese sencha, Lung Ching, Yunnan green, Pai Mu Tan), Macabeo lemon jasmine is elegant and refined. 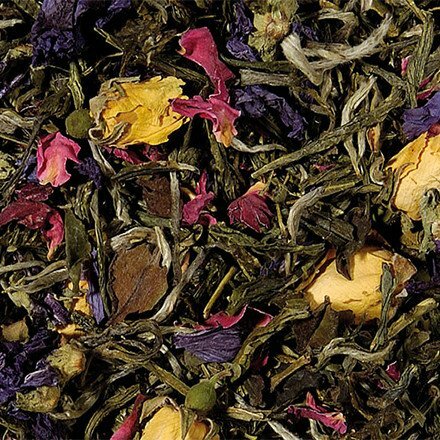 The green, silvery, brown and downy white leaves of this blend are mixed with buds and rose petals and also lilac flowers. The aroma is reminiscent of exotic fruits and a hint of flowery jasmine. In other words, its happiness in a cup. Contains: Chinese Sencha green tea, Lung Ching green tea, Yunnnan green tea, Pai Mu Tan white tea, flavors, buds and rose petals.